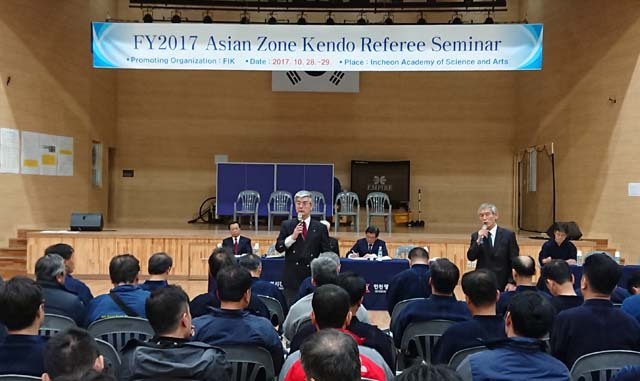 FIK Asia-Zone Kendo Referee Seminar was held on 28th and 30th Oct 2017 at Incheon Academy of Science & Arts Gym in Incheon city in Korea. The Instructors of This time from FIK were as follows. 65 trainees from 7 countries of Japan, Korea, Hong Kong, China, Chinese Taipei, Australia, and Mongolia were attended to the seminar. More than 100 including the seminar match players and local Kendo staffs were participated to the event. And especially, players in Korea performed good matches at the seminar. Following to the opening message by SHIN vice president of KKA, Chief Instructor MATSUNAGA sensei was explained what is the important point for the Kendo refereeing. And the refereeing training session was started by FUJIWARA sensei and MIYAKE sensei. The seminar was conducted by 2 courts.